The rise and development of modern Texas, as seen through the lives of a group of close-knit Texans. Director, George Stevens, gives Edna Ferber's novel the epic treatment. Stevens received the Oscar for directing this film. 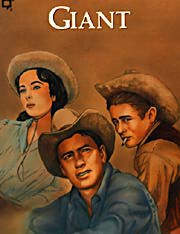 The stellar cast includes: Rock Hudson, Elizabeth Taylor, James Dean, Dennis Hopper, Sal Mineo, Rod Taylor, Earl Holliman, Chill Wills, and Mercedes McCambridge.